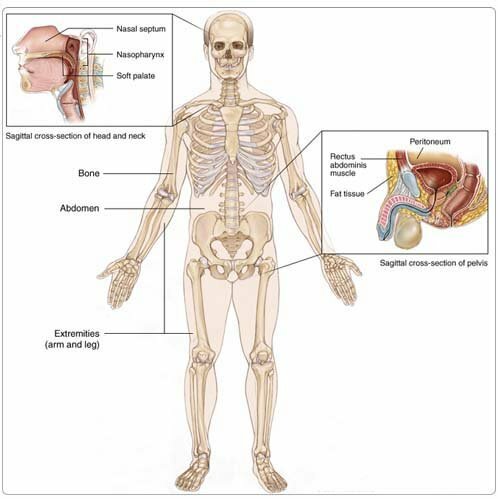 Soft tissue sarcoma is cancer that develops in the tissues that support and connect the body. It can occur in fat, muscle, nerves, tendons, joints, blood vessels, or lymph vessels. It begins when a cell grows out of control, and instead of differentiating (developing) into a normal cell, it forms a tumor (lump). When sarcoma is small, it goes unnoticed or is ignored, since it does not usually cause problems. As it grows, it can interfere with the body's normal activities. It can also spread to other places in the body. Sarcoma can appear in any part of the body. About 50% occurs in the arms or legs, 40% occurs in the trunk or abdomen, and 10% occurs in the head or neck. Sarcoma is rare, accounting for about 1% of all cancers. Most patients with smaller soft tissue sarcoma can be treated successfully. Sarcoma is named according to the normal cells it most closely resembles (Table 1). Grade is the term a pathologist (a doctor who specializes in interpreting laboratory tests and diagnosing disease) uses to describe how aggressive the sarcoma is likely to be. Low-grade tumors usually stay in one place. High-grade tumors are more likely to spread to other places, a process known as metastasis. A risk factor is anything that increases a person's chance of developing a disease, including cancer. There are risk factors that can be controlled, such as smoking, and risk factors that cannot be controlled, such as age and family history. Although risk factors can influence disease, for many risk factors it is not known whether they actually cause the disease directly. Some people with several risk factors never develop the disease, while others with no known risk factors do. Knowing your risk factors and communicating with your doctor can help guide you in making wise lifestyle and health-care choices. Previous radiation therapy. People who have been treated with radiation therapy for other cancers have a slightly increased risk of later developing sarcoma. Genetics. People with certain inherited diseases, such as von Recklinghausen's disease (neurofibromatosis), Gardner's syndrome, Werner's syndrome, tuberous sclerosis, basal cell nevus syndrome, Li-Fraumeni syndrome, or retinoblastoma are at greater risk for sarcoma. Chemicals. Workplace exposure to polyvinyl chloride (used in making plastics) or to dioxin may increase the risk of sarcoma. However, most sarcoma is not known to be associated with specific environmental hazards. People with sarcoma may experience the following symptoms. Sometimes, people with sarcoma do not show any of these symptoms. Or, these symptoms may be similar to symptoms of other medical conditions. If you are concerned about a symptom on this list, please talk with your doctor. Soft tissue sarcoma rarely causes symptoms in the early stages. The first sign of a sarcoma in the limbs or trunk may be a painless lump or swelling, which should be reported to a doctor. Most lumps are not sarcoma. The most common soft tissue lumps are lipomas, which are made of fat cells and are not cancer. People with sarcoma that starts in the abdomen may not have any symptoms or may have pain or a sense of fullness. Since soft tissue sarcoma develops in flexible, elastic tissues, the tumor can easily push normal tissue out of its way as it grows. A sarcoma may grow quite large before it causes symptoms. Eventually, it may cause pain or soreness as the growing tumor begins to press against nerves and muscles. There are no standard screening tests for sarcoma. A doctor should examine any unusual or new lumps or bumps that are growing to make sure they are not cancer. Sarcoma is very rare. This makes it important to consult a doctor who has experience with this type of cancer specifically. Benign (noncancerous) and malignant (cancerous) tumors may look different on imaging tests. In general, benign tumors have round, smooth, well-defined borders. Malignant tumors have irregular, poorly defined margins due to their aggressive growth. X-ray. An x-ray is a picture of the inside of the body. A chest x-ray can help doctors determine if the cancer has spread to the lungs. Typically, if an x-ray suggests cancer, the doctor will order other imaging tests. Ultrasound. An ultrasound uses sound waves to create a picture of an organ and its contents. Tumors generate different echoes of the sound waves than normal tissue does, so when the waves are bounced back to a computer and changed into images, the doctor can locate masses inside the body. Computerized tomography (CT or CAT) scan. A CT scan creates a three-dimensional picture of the inside of the body with an x-ray machine. A computer then combines these images into a detailed, cross-sectional view that shows any abnormalities or tumors. CT scans can screen for distant metastases. Magnetic resonance imaging (MRI). An MRI uses magnetic fields, not x-rays, to produce detailed images of the body. MRI scans are useful to check for tumors in soft tissues nearby. Positron-emission tomography (PET) scan. In a PET scan, radioactive sugar molecules are injected into the body. Cancer cells absorb sugar more quickly than normal cells, so they light up on the PET scan. PET scans are often used to complement information gathered from CT scan, MRI, and physical examination. Integrated PET-CT scan. This scanning method collects images both from CT and PET scans at the same time, and then combines the images. This technique has the advantage of looking at both the structure and metabolism of the tumor and normal tissues. This information can be helpful in treatment planning and assessing treatment benefit. Imaging tests may suggest the diagnosis of sarcoma, but a biopsy will always be performed to confirm the diagnosis and determine the subtype. It should be stressed that it is vitally important for a patient to be seen by a sarcoma specialist before any surgery or biopsy are performed. Biopsy. A biopsy, either needle or incisional, will be performed. For a needle biopsy (usually a core needle biopsy, less often a thin needle biopsy), a doctor removes a small sample of tissue from the tumor with a needle-like instrument. In an incisional biopsy, the surgeon cuts into the tumor and removes a sample of tissue. In an excisional biopsy, the surgeon removes the entire tumor. A pathologist will then examine the tissue under a microscope to check for cancer cells. The treatment of sarcoma depends on the size and location of the tumor, its grade, its subtype, whether the cancer has spread, and the person's overall health. In many cases, a team of doctors will work with the patient to determine the best treatment plan. If the tumor cannot be removed by surgery, some tumors can be permanently controlled with radiation therapy. For tumors that can be surgically removed, radiation therapy and/or chemotherapy may be given before or after surgery to reduce the likelihood of local and distant recurrence of the tumor. Chemotherapy and radiation therapy may also be used to reduce the size of the sarcoma and relieve pain and cancer symptoms. Chemotherapy may be given alone or in combination with surgery and/or radiation therapy. Surgery is the main treatment for soft tissue sarcoma. The surgeon's goal is to remove the tumor and at least 2 cm to 3 cm (about 1 inch) of healthy tissue around it, to leave behind a clean margin. Small sarcomas can usually be cured by surgery alone, but those larger than 5 cm are usually treated with a combination of surgery and radiation therapy. Radiation therapy may be used before surgery (to shrink the tumor and make removal easier), or during and after surgery (to kill any remaining cancer cells). Chemotherapy is the use of drugs to kill cancer cells. Most chemotherapy drugs are given by injection into a vein (called intravenous or IV injection). Among the chemotherapy treatments that might be used alone or in combination include doxorubicin (Adriamycin), ifosfamide (Ifex), gemcitabine (Gemzar) in combination with docetaxel (Taxotere) and paclitaxel (Taxol). The active drugs depend on the subtype of sarcoma: not all drugs are active on sarcomas. Chemotherapy for sarcoma can usually be given as an outpatient treatment. Most side effects of the drugs disappear within a short time after treatment. Chemotherapy is often useful in cases in which a cancer has already metastasized. A fast-growing sarcoma can be treated with chemotherapy before surgery. This often reduces the size of the main tumor and may destroy tiny areas of metastasis if some of the cancer cells have already drifted into other areas. For large high-grade sarcoma, where surgery may not be possible or problematic, oncologists may recommend giving chemotherapy for three to four cycles before surgery to shrink the primary tumor, allowing surgery to be less radical. Some chemotherapy before surgery may also improve survival since it may kill cells that have broken away from the original tumor. Chemotherapy given before surgery is called preoperative chemotherapy, neoadjuvant chemotherapy, or induction chemotherapy. Chemotherapy given after surgery is called adjuvant chemotherapy. After the patient has recovered from surgery, the oncologist may give more chemotherapy to kill any remaining tumor cells. New treatment strategies are designed to stop the growth of cancer cells at the level of genes and proteins. In 2002, the U.S. Food and Drug Administration (FDA) approved a drug called imatinib mesylate (also known as STI571 or Gleevec) for the treatment of gastrointestinal stromal tumor (GIST) in advanced stages. This drug is now the standard treatment for GIST. New target drugs are being tested. Sunitinib malate (Sutent) is a new drug that shows promise for the treatment of GIST, including for patients whose GIST is not treatable with imatinib. Radiation therapy is the use of high-energy x-rays or other particles to kill cancer cells. This may be done before surgery to shrink the tumor, so it is more easily removed. Or, it may be done after surgery to remove any cancer cells left behind. Radiation treatment may make it possible to do less surgery, often preserving the arm or leg. Radiation therapy also damages normal cells, but because it is focused around the tumor, side effects occur mainly in those areas. Most radiation therapy side effects disappear soon after treatment ends. Newer radiation techniques, including intensity modulated radiation therapy (IMRT) and proton beam irradiation, may improve the control of sarcoma, as well as reduce the frequency of shorter-term and longer-term side effects. An advanced sarcoma is one that has recurred (come back) after treatment or spread to other sites at the time of diagnosis. The recurrence may be in the tissues where the sarcoma first appeared or in another place. About one-third of patients treated for soft tissue sarcoma of the arms or legs have recurrence of their tumor-most likely in the chest. More than half of those treated for sarcoma of the abdomen or trunk will have some type of recurrence, which can be local, regional, and/or distant. Treatment of the recurrence will depend on the location and type of recurrence and on the method of previous treatment. An isolated local recurrence is usually treated with additional surgery plus radiation therapy. Treatment of sarcoma that has spread to other organs or lymph nodes may include surgery alone, surgery plus radiation therapy, or chemotherapy alone. Chemotherapy combinations are often used for advanced soft tissue sarcoma. Patients who have been treated for sarcoma should have follow-up examinations at least every year to watch for recurrence. This should include a physical examination and chest CT scans or x-rays, and may include other imaging studies such as an ultrasound or MRI. Patients who have been treated for soft tissue sarcoma should be particularly careful to report any new symptoms, such as a cough or a new lump. These may be signs of a cancer recurrence, or they may be side effects of treatment. Most patients who have been treated for soft tissue sarcoma should continue to have follow-up examinations for 10 years. If a recurrence happens, it is likely to be within the first two years, but some sarcomas recur much later. Most of these recurrences can be treated. Cancer and cancer treatment can cause a variety of side effects; some are easily controlled and others require specialized care. Below are some of the side effects that are more common to sarcoma and its treatments. A rehabilitation program after surgery or radiation therapy can be important to help the patient treated for sarcoma regain or maintain optimal limb function. Range-of-motion exercises, strengthening exercises, and a program to reduce limb swelling if present may be prescribed. A formal consultation with a rehabilitation medicine specialist may be extremely important to help optimize the rehabilitation of the patient after treatment. It is worth noting that the majority of patients with a sarcoma in an extremity can be successfully treated and do maintain good limb function. For some patients, generally those with very large tumors involving the major nerves and blood vessels of the arm or leg, amputation is necessary to control the tumor. This can also be necessary if the tumor grows back in the arm or leg after prior surgery, radiation therapy, and/or chemotherapy. For these patients, access to prosthetic services (artificial limbs) and mental health support can help manage the adjustment to life following amputation. Regularly scheduled follow-up visits with the doctors involved in the sarcoma treatment is not only important to detect any possible tumor recurrence, but also help to manage and hopefully prevent some side effects related to treatment. A commonly used follow-up schedule is visits every three to four months for the first three years after treatment, and then every six months until five years after the completion of treatment, and then annually thereafter. Periodic chest x-rays or CT scans will be done to detect possible later spread of cancer to the lungs during these follow-up visits. Imaging of the site of the original tumor with MRI, ultrasound, CT scan, and/or PET scan is also sometimes performed. The region of the body that received radiation therapy can be at risk for limb swelling, fracture of the thigh or leg bones, reduction in mobility of joints, and fibrosis (hardness) of the soft tissues. Limb swelling can be managed with compression stockings and other special therapies that can be prescribed by doctors. Bone fractures may be prevented by avoiding certain high-impact exercises, which patients should discuss with their doctors. Joint mobility can be improved with a rehabilitation program. Fibrosis may respond to several months of treatment with a combination of vitamin E and pentoxifylline, another oral medication. Skin in the radiation field should be protected from sun exposure with clothing or sunscreen to reduce the chance of a skin cancer developing in that area.